The green-cheeked conure is found in wild in Brazil, Bolivia, Argentina and Paraguay, where it inhabits forests and woodland areas. Measuring from the beak to the tip of the tail feathers, the length of the green-cheeked conure is approx. 10 inches. They measure 5 to 5.5 inches during wingspan. The plumage of these birds is very colorful. The feather on their head is dark-gray to blackish, or brown. Their cheeks are green, as their name suggests. The color of their feet is also dark gray. Their tail feather is completely maroon in color. They have a long tail of about 4 to 6 inches, which is gradually tapering at the tip. The green-cheeked conure is a little clown, always full of antics. These birds love to hang upside-down and clamor along the cage bars, waiting for their owners to play with them. 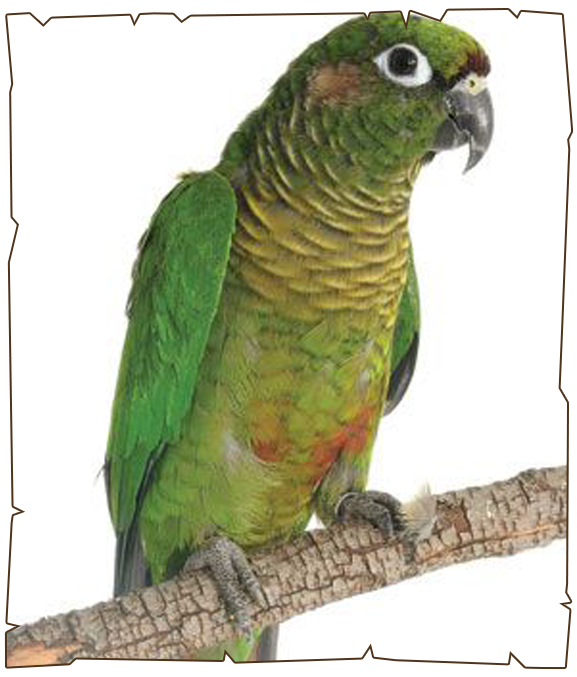 Green-cheeked conures have been known to talk, and some are able to learn quite a few words. In the wild, they live in flocks of up to 10 individuals. They prefer living in forest areas and on tree tops. They love chewing their foods before consuming.